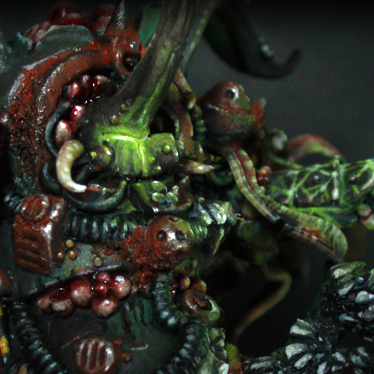 This is such a characterful version of Typhus, I love it! This model is completely scratch built, made almost entirely out of green stuff. The hobbyist said he was trying to stick closer to the feel of the artwork as opposed to the stock model, and I would say he nailed it on the head. It's a little more exaggerated in proportions and pose, but I think that was unavoidable if you really wanted to get the feel of the art. I like the style more then what GW did for their model to be honest. The smoke and flies coming out of him are fantastic as well and really add to the sense of movement he has. It really feels like he is lurching to the side. Not only is the sculpting great but the painting is out of this world. Again, it's a little more exaggerated then what we normally see, but it works! The contrast of the glowing green on the left side of his body with the darker, and more gruesome tones on the right side really make this guy stand out. 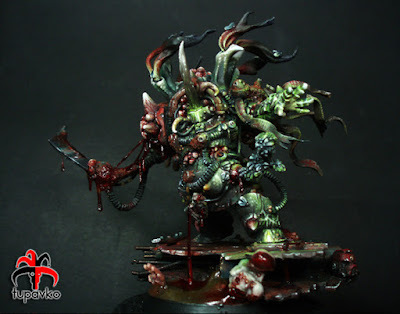 It's looser in style then what is normally considered top tier painting, but it fits Nurgle and gives it more of an artistic, impressionist feel. I love how the chaos energy is crackling down his hand and arm. I would love to see this mini is person. Typhus is a favorite of mine, and I have to admit, this puts my own conversion and rendition of the Herald of Nurgle to shame.